In 2017, as North Korea carried out further nuclear weapons and ballistic missile tests, since conducting its first nuclear test in 2006, the UN Security Council adopted several resolutions condemning the launches and toughening sanctions against DPRK. 3 September, 2017: DPRK conducts its sixth nuclear test. 11 September 2017: The UN Security Council unanimously adopts a resolution imposing fresh sanctions on DPRK, targeting the country's oil imports, and textile exports. 13 November, 2017: The 193-member UN General Assembly adopted a resolution urging Member States to observe the ‘Olympic Truce’ throughout the 2018 Winter Games in the Republic of Korea, and expressed its expectation that “Pyeongchang 2018 will be a meaningful opportunity to foster an atmosphere of peace, development, tolerance and understanding on the Korean Peninsula and in Northeast Asia”. 14 September, 2017: Ballistic missile from DPRK flies over Japan - Security Council press statement condemns launches citing "outrageous actions" and demanding North Korea complies with UN resolutions to halt nuclear programme. 15 December, 2017: Council holds ministerial-level meeting on "Threats and Challenges posed the by the DPRK to International Peace and Security". 9 January, 2018: North and South Korean officials meet and agree the north will send athletes and delegates to the upcoming Winter Olympics across the border in Pyeongchang. 9 February, 2018: South and North march together during the opening of the Olympics. Secretary-General Guterres, who attended the Games, said that though the Olympic tradition of peace and cooperation was a global one, it had special resonance on the Korean Peninsula. 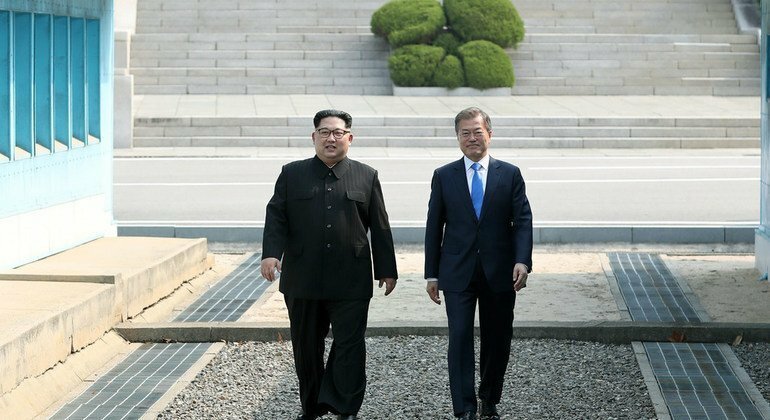 27 April, 2018: DPRK leader Kim Jong-un holds historic summit meeting with President Moon Jae-in of the Republic of Korea, on the border between the two countries, after the North says it has suspended nuclear and long-range missile tests, and plans to close its nuclear test sites. 10 May, 2018: President Trump first announces his intention to meet the North Korean leader, on June 12. 12 June, 2018: DPRK leader Kim Jong-un and President Donald Trump meets in a historic summit between the two countries over the denuclearization of the Korean Peninsula. 19 September, 2018: DPRK leader Kim Jong-un and President Moon Jae-in of the Republic of Korea hold the third inter-Korean summit in Pyongyang and issue a joint declaration. Improve the nutritional status of the most vulnerable people using an integrated and multi-sectoral approach that includes improved and stabilised food security and screening for acute malnutrition. Partners will work to ensure that the most vulnerable people, particularly pregnant and breastfeeding women and under-five children, have access to sufficient nutritious food, and that acutely undernourished children are effectively treated with therapeutic food and supported through optimal infant and young child feeding practices. Reduce preventable mortality and morbidity through increased access to health, water, sanitation and hygiene services. Partners will ensure that the most vulnerable people, including children, women, people with disabilities and the elderly, have access to basic health services including maternal, new-born and child health, immunizations and early interventions for people with disabilities. Access to basic services also includes access to improved water, sanitation and hygiene services. 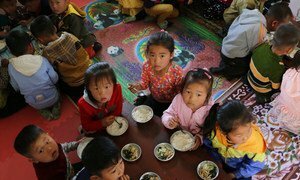 Build the resilience of the most vulnerable people in DPRK to recurrent disasters, particularly floods and drought. 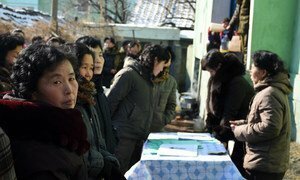 Partners will ensure that life-saving assistance meets the different needs of those most affected by disasters and that the DPRK Government and communities have the capacity to prepare for, respond to, and recover from shocks related to natural disasters. 2012 – Heavy rains caused flooding in North and South Pyongan killing 231 people and affected more than 240,000 people, leaving 212,000 people homeless. 2013 – Heavy rains caused flooding, severely affecting North and South Pyongan, killing 189 people and affecting 800,000 people and displacing 49,000 people. 2014 – A dry spell over eighteen months from March 2014 caused drought, affecting agricultural production and access to water. 18 million PDS-dependents were at risk of food insecurity, malnutrition and illness. 2015 – Heavy rain and Typhoon Goni caused flooding in South Hwanghae, North and South Hamgyong, particularly Rason City, affecting 22,000 people and displacing 15,000 people. 2016 – Heavy rain from Typhoon Lionrock caused flooding North Hamgyong, killing 138 people, affecting 600,000 people and displacing 68,000 people. 2017 – The Government declared a national emergency in June, following a dry spell that affected key food producing provinces in the south-west of the country. The dry spell compounded the undernutrition situation, putting at risk the lives of 782,000 children under five and 313,629 pregnant and lactating women.